Vote for Indian Entrepreneur Avinash Dhume!!! GET INVOLVED AND CAST YOUR VOTE FOR BYST SUPPORTED ENTREPRENEUR AVINASH DHUME IN THE INTERNATIONAL ENTREPRENEUR OF THE YEAR PEOPLE’S CHOICE AWARD! Voting lines open from - 9th to 16th July! We are pleased to announce that throughout next week Bharatiya Yuva Shakti Trust (BYST) supported entrepreneur Avinash Dhume will be competing for the worldwide People’s Choice award of the Youth Business International (YBI). The Prince’s Trust is a leading member of YBI. Avinash is one of the four finalists amongst competitors from over 40 countries. Anyone anywhere in the world can vote online at the dedicated Entrepreneur of the Year Website. People’s Choice is a huge competition with a truly global reach. A real entrepreneurial success story, the entrepreneur from India Avinash Dhume set up his business Kaushalya Publications, a publishing company specializing in affordable, educational material with support from Bharatiya Yuva Shakti Trust (BYST) is in the final of the Peoples Choice Award. The Youth Business International People’s Choice award is given to the entrepreneur who gets the most votes from the public around the world. With finalists competing from China, Argentina and Barbados, Avinash from India needs all the support we can give him. Avinash develops content and publishes a wide range of economical books for schoolchildren. He comes from a lower economical background. After gaining work experience for over 10 years with a very meager salary in a publication house, he along with two of his friends ventured into setting up their own business. Initially, the business went into a loss and with the able support and guidance of mentor, Mr Vijaysinh Maurya turned it into a profitable business within three years. Today they are proud of providing employment to 35 others both directly and indirectly and generating wealth of Rs 42 lac. He has moved on from publishing scholarship book for 4th Std to publishing 52 different kinds of books for academic purpose and is well positioned for further expansion. He also involves himself in social activities and distributes books free of cost to poor people helping 200 such students last year. We would like to encourage you to use this as an opportunity to reach out to your contacts and encourage them to vote for the Indian entrepreneur from BYST. Please use all the communications tools you have – word of mouth, email, media, Face book, Orkut, Linked In etc to encourage your contacts to vote for Avinash Dhume. The winner is the one who secures the most votes. Voting is open on Monday and runs from the 9th July to the 16th of July. We want to encourage you cast your vote for the Avinash & make India proud. Let us give Avinash and Kaushalya Publication the recognition they deserve by making them the People’s Choice 2012! University of Pune (UoP) has revised MCM - Masters in Computer Management syllabus w.e.f. June 2012 which aims at creating IT professionals emphasizing study and creation of business applications(Hardware & Networking/Software Testing/Application Development) rather than mere programming. "The new Syllabus for MCM encourages all round personality development of students and latest technology trends. IT professionals from IBM, TCS, Infosys, WNS, Saama Technologies, Wipro, Persistent, Cybage, and Zensar have participated in farming the new syllabus," says Dr. Deepak Shikarpur Chairman Board of Studies(Computer Management),UoP. The first two semester of the programme are a mix of the computer –related and general business courses. Inclusion of mobile technologies, web technologies give a new platform to students to work on. Specializations are included in the third semester which includes network technology, Software Testing and Software development. Inclusion of specialization papers improves knowledge of students in those subjects. It will focus on particular technology in which the students are more interested. Soft skills technologies are covered in each semester leading to overall personality development of the students and that will be help them in their placement activities and to sustain in the organization successfully. After completing MCM you can get a job in IT sector which is a sunrise industry and is expected to grow by 15-20% yearly in the next five years. This sector will need a minimum two million (20 lac) skilled professionals globally in the next five years. Alternatively you can also do Ph.D and get into teaching. Why do we need global leaders? The voyage of a pair of blue jeans, from inception to product release, offers a glimpse into the international — and complex — world of business today: The cotton may be picked in Peru or Uganda, shipped to China for finishing, and then sent to Malaysia to be woven into yarn. The yarn goes to Thailand where the fabric is made; that fabric is then cut in Singapore and sent to Indonesia for sewing. Labels from India. Zippers from Hong Kong. Thread from Malaysia. Buttons from Taiwan. The range of countries and systems involved in this production demonstrates that business in many industries (automotive and electronics, food and pharma) has become inescapably linked across borders. But it’s more than mastering geography and culture that makes a leader today. You must master the complex mind-set and competencies needed to lead in today’s fully globalized world. In Being Global, Angel Cabrera and Gregory Unruh of the Thunderbird School of Global Management set a new context for global leadership, illustrating both the challenges and the opportunities facing today’s executives. Being Global is written for leaders at all levels of their careers who aspire to think and act globally, and who need some help getting there. IT, Finance, HR, Marketing, Banking are the common specializations which come to any candidates mind when they think of pursuing MBA. But with the nature of businesses and economy getting dynamic with each passing day in the context of globalization one has to think beyond the common MBA specializations. It is in these areas where umpteen opportunities and less saturation exist. One such offbeat specialization is Logistics/Supply Chain Management. Emergence of organized retail, increase in foreign trade, growth of manufacturing sector has contributed to the growth of Logistics industry in India. Good logistics and supply chain management departments have become imperative to every industry/company having plans to expand globally. Automobiles, Aviation, Mining, and Consumer Goods are some of the sectors that are investing heavily on logistics industry. Logistics Industry is expected to grow annually at the rate of 15-20% by 2015. Some of the important functions of the Logistics Department include – materials management, purchasing and stores management, manufacturing and operations management, buying, physical distribution of goods and supply chain management. We at FORESIGHT believe in equipping the students with the RELEVANT Degrees for the opportunities which lie ahead. The curriculum of Logistics Management enables the participants to make use of their knowledge in the different business processes that are involved in Logistics. A unique book that talks about the world of business to teenagers. You are 16, going on 17. Steve Jobs was all of sixteen when he met Stephen Wozniak. What resulted was Apple. When Sergey Brin and Larry Page met at Stanford, they were in their early twenties. They were soon to start Google. Today’s teenagers are our smartest generation yet. They are tomorrow’s entrepreneurs, investors, managers, policy makers, watchdogs and of course, consumers. But do you know what the corporate and business world is all about? How do businesses touch everyone’s lives? What really makes an entrepreneur tick? How does the engine of a company run? Who is a social entrepreneur? And why do we need the world of business—is business good or bad for us? 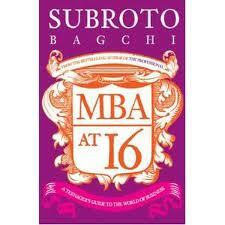 If you are curious, come join Subroto Bagchi and a group of smart teenagers on their exciting voyage of discovery, and in the process, get yourself a teen MBA! Nowadays many students prefer Professional Degree for Undergraduate Studies as this leads to Job Placement in companies directly after 3 years of education. Bachelors of Business Administration-BBA is one such program directed at preparing participants for the challenges of management positions. The program blends the three core disciplines of management, communication and information systems into a balanced program providing the contemporary manager with effective skills. In addition, the program offers general business courses to broaden the prospective manager’s knowledge base. Anybody who has completed 12th(Science, Arts, Commerce) is eligible for this program. Developed broad and flexible competencies in business. Developed management skills required by the managers of private and public organizations. Developed an understanding of how businesses survive and prosper in a rapidly changing environment. Demonstrate advanced skills in the effective analysis, design, and realization of business systems utilizing contemporary information technology. Have acquired appropriate intellectual, professional and personal attributes and skills and continuously work to sustain and improve their professional competencies to succeed in a competitive professional environment. Possible employment opportunities for graduates of the BBA could include junior executives in Marketing, Finance, Strategic Operations and Human Resource in business and corporate houses, multinational companies, airlines, factories, industries, government departments. Take a Tour of the TRAVEL Industry!! The tourism industry in India is increasing at a pace of 38% per year. Due to rise in the disposable income of middle-class and introduction of low cost airlines and innovative travel-promoting programs more and more Indians are traveling for work/business and leisure. International Holiday Tours, Domestic Holiday Tours, Inbound Tours, Outbound Tours, Business Tours, Study Tours, MICE(Meetings, Incentives, Conventions, Exhibitions) Tours, Group Tours, Medical Tours, Sports Tours, Cultural Tours, Adventure Tours, Jungle Tours, Agriculture Tours and Offbeat Destination Tours are the various segments in Tourism which have witnessed tremendous rise. The Tourism Ministry of India is also promoting Travel & Tourism sector by kickstarting various projects and promotional campaigns like “Incredible India” to promote Destination India in the International Market. Candidates who wish to pursue a career Travel & Tourism can get jobs in Tour Companies, Airlines, Travel Agencies, in-house Travel Departments of companies, Travel Portals with a wide range of segments for specialization. Remuneration packages offered by Travel & Tourism sector have increased significantly in the last 3 years and are currently at par with other sectors. By studying Industry-relevant professional courses in Travel & Tourism you can be a part of this Sunshine Industry. Join the Travel BOOM which is growing with each passing year!! FORESIGHT nurtures a set of values that makes for a winning attitude – that is, professionalism, respect, open communication, fairness, integrity, and teamwork. Our vision is to impart an innovative and applied education in tune with the times and to equip young people from across the country and abroad to make meaningful contributions to an economy that is increasingly locking into the global arena. We have come a long way only to guide our students to achieve their career goal. Our framework is ready to enable you to enhance your talent, seize opportunities, and anticipate challenges in the process help you to grow.